Rich is the first Daybreaker of the Month for North! 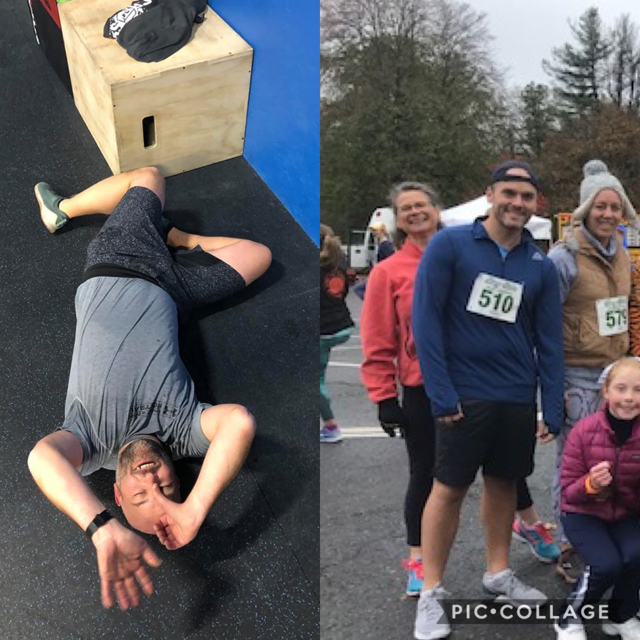 Rich and his wife Erin, were some of the first founding members at North and have quickly adopted CrossFit into their daily lifestyle, attending either the 6:30a or 5:30p classes 3-4 times per week. Rich works hard, has a positive attitude and is always willing to try something new. With the support of Erin, Rich crushed the nutrition challenge by giving up beer and treats for 4 weeks and has lost 16 pounds! He’s also leaner, feels better and all of his lifts have improved! Ben, also a nutrition wizard, placed second with Bryan M during our last nutrition challenge. Ben consistently attends the 6:30a class 5-6 days per week. Ben came to Daybreak with an engine, but his consistency and hard work has resulted in some major lifting gains. Recently, Ben push pressed 130 pounds for 3 reps and PR’d his cleaned at 145 pounds! Tell us about your CrossFit journey so far. What have you learned about yourself? What keeps you coming back? So I joined when Daybreak North opened and really had no idea what to expect. I knew I was out of shape and was pretty intimidated proving that to everyone! But everyone was really welcoming and even though I didn’t understand half of the terminology and what the instructors were saying to me, everyone helped and the instructors broke it down for me. I’m now at 3 months in and feel like I’ve made lots of small improvements, whether that’s in terms of strength, technique or flexibility. The one thing that has surprised me about CrossFit is how technical it is. The diversity of the movements and daily WOD’s means I’m keen to learn and continue to improve. Mel, Erica and the team have made CrossFit addictive, I call them my dealers. I can’t think and listen at the same time (and I get really frustrated with myself), counting is a struggle and math at a high heart rate is virtually impossible. Tell us something that would surprise us to hear you’ve done. Thankfully, my acting career didn’t take off after playing a role in 2 TV commercials while working at an advertising agency right after college. Perhaps I wouldn’t be a Daybreaker if it did! Kid Free, “Rich time” – either going off golfing or just having the remote to myself and watching Soccer/Sport all day and whiskey, preferably a single malt. If you had to live in a book, show, or movie, which one would it be? If I had to live in a TV show I would live in House Hunters International – I’d get to travel the world, meet all sorts of interesting people, try new foods and see amazing places. I would gather enough supplies for at least 90 days move to the mountains near a water supply and learn to hunt for food. Although seeing as I had to google all that information I’d probably be the first to go! live in Sudbury with my wife Nicole and our son Henry (5). You may have seen Henry around – or heard him screaming “Daddy!” in the middle of a WOD – on the weekends. I am General Counsel at a biotech in Cambridge. I like the job and technology but the long commute is kind of a drag which is part of the reason that I started doing CrossFit. I’ve been doing CrossFit regularly since June 2018 (about 8 months) and have really enjoyed it so far! I’m a regular at the 6:30 AM class in Wayland (it is a great group). What keeps you coming back to CrossFit each day? I like the constant variation and challenge, the endless room for improvement, and the excellent coaching at Daybreak. I work out way harder on a day-to-day basis than I would with a regular gym membership. I have also seen results in my 8 months at Daybreak and am motivated by seeing the times/weights posted each day by other members. What were you in high school (class clown, nerd, jock, loner, etc.)? Maybe a loner with class clown tendencies? I’m trying to block it all out. What’s your favorite song to blast and sing along to when you’re alone in your car? I have an affection for 80s rock. Anything off “Appetite for Destruction” may get me singing in the car. Speaking of, we definitely need to get an 80s rock playlist in circulation at Daybreak. What is the best pizza toppings combination? Not fair to ask this during the nutrition challenge, but I like sausage, pepperoni, mushroom, and green pepper. What’s your spirit animal (an animal that represents you)? I think I’m a Squirrel? Well deserved Ben! You’re acing XFit. Keep showing up Rich the long term benefits are incredible.